In “Color Me Purple,” my book for children ages 8-12, the character Gommgi is music smart. She loves music and is recognized for the excellence of her piano performances. In this photo, I met a music smart child in the making. The research says that smart children often hum and sing early, have the ability to reproduce songs easily, show a strong desire to play an instrument, and display an emotional sensitivity to music. Little Maeve, while playing at her Grandma’s, broke into lullaby as she hugged and rocked her doll. She decided her lilting version of “Twinkle, Twinkle Little Star” needed piano accompaniment, and after playing one chorus invited me to join her in a duet version. Yes, Maeve definitely is showing an early love and talent in music! Wherever their curiosity and interest takes them, catch the moment! When I wrote Grandma Says It’s Good to Be Smart, I was afraid I might eliminate sales to grandmothers known as Grammie, Bubba, Nana, and the myriad of names based on cultural heritage. I was correct, which is sad. Although I wrote it for my grandsons, the book is based on my experiences as an educator. I wrote it for all young children. I could have entitled it, My teacher says… . But I wanted it to be from the me I am now. My hopes were that I could inscribe books for any grandmothers in ways that would personalize it for them. In the promotion of Melanie’s book, nothing is said about the importance of books, reading , or growing up smart. But my sense of Melanie’s mission is that she believes in all three. My point in writing this short piece is to CALL ALL AUNTS, NANAS, BUBBAS, GLAM-MAS, DADIMAS, GODMOTHERS, i.e, all savvy women in the lives of children not their own. Talking reading, exploring, imagining, asking questions, dreaming, writing, experimenting, practicing, gaining confidence, and on and on – your little ones need your guidance as well as the guidance of their parent(s) or primary caregivers. They don’t automatically grow up smart, even if they are born full of curiosity, alertness, and quick learning ability. Our American society is sports oriented but not smarts oriented. Skills and interests must be nourished. Children need to hear how proud we are of their every accomplishment. So change the name of my book, share it, and share it’s message. Savvy auntie says it’s good to be smart. 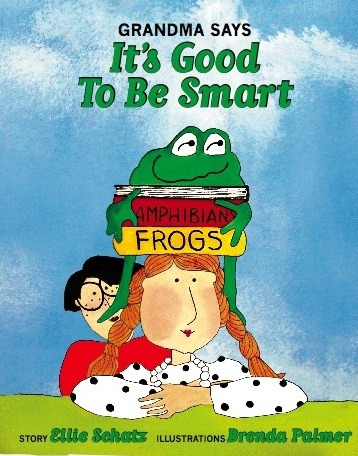 Warm and wonderful godmother says it’s good to be smart. Nana says it’s good to be smart. Glam-ma, I would guess, says it’s good to be smart. After all, the ‘glam-ma’ I’ve followed on television and in movies over the years is quite a talented lady. And she’s passed it on to the next generation.